Shoftim: Who Is My Idol? Image: A collection of idols: Egyptian gods, Elvis, Marilyn Monroe, Israeli fighter jet, smartphone, Greek demi-god, Kardashians, U.S. Twenty dollar bill, Andrew Jackson, Child sacrifice, Moloch. Collage from public domain photos by R. Ruth Adar. The follow-up to“Tzedek, tzedek tirdof!” seems like a non sequitur. It is a commandment against idolatry via the Asherah pole or a stone pillar, either of which is an idol. So we might ask: what’s the connection? God detests idolatry. It’s one of the major themes of Deuteronomy: don’t make idols, don’t hang out with idolaters, don’t even think about idols. In the historical period when this book was written, that meant, don’t worship any god other than the one named Yud-Hey-Vav-Hey who brought you, Israelites, out of Egypt. Archaeologists tell us that in fact there was a lot of other-god-worshiping happening in the Land of Israel at the time. The goddess Asherah, wife of El, was particularly popular – hence all the commandments against setting up Asherah-poles, as in the verse above. So we have first, a famous verse commanding the pursuit of justice. Following it, there is a commandment against idolatry. Only a year ago, a group of people gathered in Charlottesville, VA, because they loved the statue of a dead man and they wanted to preserve it. It was so important to them that they put on a show of weapons and violence. They marched with torches, with weapons, and chanting angry slogans. They were there for a more complex set of reasons than a statue of Robert E. Lee. They felt that a respectful memory of the Confederacy is important. They feel their way of life changing, and they don’t like it. Other people – many of the local citizens of Charlottesville – felt that it was time for that way of life to change, because that way of life, to them, is called racism. That’s why their city government had taken steps to get rid of the statue. Now I ask you: is it not idolatry to take a statue so seriously that it is worth a show of violence? Is it not idolatry that a woman was killed by someone who felt he was defending the statue? Racism is in fact a modern brand of idolatry. It insists that some human lives are rightly privileged above others. It contradicts the Jewish concept of B’Tzelem Elohim, that all human beings are made in the image of God. Now, lest my readers think this is just an exercise in pointing out where other people are messing up, let’s turn this insight upon ourselves. When we decide to pursue justice, we need to ask ourselves about idolatry. Not “Whom do I worship?” but “What or whom do I prioritize above all else?” Specifically, when I think I’m doing justice work, I need to examine and reexamine my priorities: for whom am I doing this work? Who benefits? What’s my payoff for doing the work? If I fight for justice when “justice” will also keep people I don’t like out of my face or my neighborhood – what am I really worshiping? If I fight for justice, but only if it won’t cost me a dime – what am I really worshiping? If I fight for justice, but only if I always get credit for what I do – what am I really worshiping? We can be idolaters in the 21st century. If I want to know what I worship, all I really need to do is to take a hard look at what’s most important to me. What am I willing to defend with my reputation, with my money, with my life? We all have something that is more important than anything else to us. Whatever that may be, it is the thing we worship. Whom or what do you prioritize above all else? Don’t tell me in the comments – tell yourself. Then decide if that’s really the worshiper you want to be. Posted on August 17, 2018 Categories D'var Torah, ElulTags Idolatry, justice, ShoftimLeave a comment on Shoftim: Who Is My Idol? Image: Elie Wiesel (Photo: AP/Bebeto Matthews) Mr. Wiesel was a tireless advocate for the underdog, based on his own experience as an enslaved person in Auschwitz. What need have I of all your sacrifices? says the Eternal. And I have no delight In lambs and he-goats. That you come to appear before Me— Who asked that of you? Bringing oblations is futile, Incense is offensive to Me. Assemblies with iniquity, I cannot abide. They are become a burden to Me, I cannot endure them. Though you pray at length, I will not listen. Put your evil doings away from My sight. Cease to do evil; Learn to do good. Devote yourselves to justice; Aid the wronged. Uphold the rights of the orphan; Defend the cause of the widow. The prophet Isaiah made it abundantly clear in Chapter 1 of his great book that the Jewish mission is not merely to perform rituals but to aid the wronged in the world. He he closes this salvo with specific directions about two of the most woeful elements of Jewish society in his age: orphans and widows. He did not specify Jewish orphans and widows, and later commentators made it clear that if only for the long-term good of the Jewish people, we were never to limit our efforts to fellow Jews. We were to devote ourselves to justice for all the oppressed. For most of Jewish history since that time (these lines were written just before the Babylonian Captivity) the Jews themselves have been a persecuted and often homeless people. Still, relief for the poor and the weak and the disenfranchised has been part of our portfolio, indeed it has BEEN our portfolio. Abraham came forward and said, “Will You sweep away the innocent along with the guilty? What if there should be fifty innocent within the city; will You then wipe out the place and not forgive it for the sake of the innocent fifty who are in it? Abraham argued with God – with the Holy One! – bargaining for the souls of the innocent in the cities of Sodom and Gomorrah, even though he had no idea whether there were so many blameless souls. What a bleeding heart he was! God was set to blast all of them for the sins of which only some were guilty. God is aware, of course, that there are not ten righteous men in the doomed cities, but watches as Abraham bargains furiously for them. This is the Abraham whom God chose out of all the people in the world at that time, because of his fervour for justice and his kind heart. The sages teach us that it was exactly this quality that attracted God to Abraham. God had considered Noah, but Noah never advocated for the innocents who would die in the Flood. Centuries of suffering schooled the hearts of the Jews, and for much of U.S. History Jewish Americans served among other Americans in leadership of great social movements: the labor union movement, the civil rights movement, the women’s movement, the LGBTQ movement. We have not always been in the right; a Jew served as one of the leaders of the Confederacy, to give only one example. Jews have done evil as well as good. We are as prone to error as anyone. This is not “politics.” This is speaking up for the five-year-old separated from his mother, speaking up for the refugee who has lost her home, speaking up for the young person terrified that he will be deported to a place where he is under threat of death. It is based on the texts in Leviticus 19 which forbid standing by as another person bleeds to death, and in which we are admonished to love the stranger. And of course, we are Jews, so we will argue about specific applications, but if we say, “We need not be concerned about this “we must think back to those dark years in the 1930’s when all doors slammed in our faces. That was not just “politics.” That was murder. Chapter 1 of Genesis teaches us that words create worlds. That’s all. You can get hung up on “days” or evolution if you wish, but the message there is plain as day: words create worlds. Jewish tradition teaches us that this kind of creation did not stop with the first Shabbat: each of us has this beautiful, terrible power to create realities with our words. Jewish tradition teaches us that saying embarrassing words can cause wounds so real that they are the equivalent of murder. Recently I saw a clip of a 1962 speech by Malcolm X, and in it he elucidates the ways in which our media create a reality that frames the way we interpret violence. His point was very Jewish: words create reality. If most of what we see of African Americans in the news is about criminal activity, then we are less inclined to give the benefit of the doubt to any African American who is arrested or injured by police. If any good news about an African American is framed as a “remarkable accomplishment,” then we are inclined to think that most are not capable or not willing. Words create worlds. When I hear that someone has been stopped for questioning, do I assume that they are guilty of something? What if I hear that a person I know has been stopped? What if I hear that a person like me has been stopped? And what if I hear that a person from a stigmatized category has been stopped? What do I think then? My children grew up in Oakland, CA. They are two white men, and because they’ve grown up in Oakland, they have many friends who are African Americans or Latinos. Since they were in middle school my sons have seen how their friends are treated by the police and as a result, they are distrustful of law enforcement. Conversely, I tend to trust the cops, because I’m white and grew up in the Southeast. We’ve had many interesting discussions on our differences of perception; over time I’ve come to realize that I’ve lived a very sheltered life in this respect. We have a crisis of confidence in the USA today, one that undermines our system of laws. People of color believe that they are harassed unfairly by police, that they are arrested more often than white peers, that they are convicted more often and spend more time in prison than white peers. In states that permit the death penalty, they are executed far more often than white peers. In short, many African Americans believe that the entire system of justice is geared to treat them unfairly and that they cannot expect justice from it. One could write this off as paranoia, except that the statistics bear it out. In “Fourteen Examples of Racism in Criminal Justice System” Bill Quigley has assembled a horrifying list of examples of studies which conclude that the US criminal justice system treats people of color unfairly. While African Americans are only 13% of the US population, they comprise 37% of those arrested for drug offenses, even though studies have shown that they engage in drug offenses at rates comparable to the white majority. That’s just the first item on his list – click the link and read the rest of it. So when an unarmed African American youth is shot dead in the street by a white police officer in broad daylight, it should not surprise us at all that his family and many others believe that there might be something amiss. Given that his is the latest in a string of highly publicized deaths of unarmed young men of color, it should not surprise us that many people are angry and demand justice. And now that a grand jury has returned from its deliberations behind closed doors with no indictment, it should not surprise us that parts of this nation are overwhelmed with anger and grief. Judaism teaches us that justice is an essential value. Justice is not only punishment meted out to the wrongdoer; it is also the assurance that the innocent will not be punished. Justice is even-handed towards all classes of people: “You shall do no unrighteousness in judgment; you shall not favor the poor, nor favor the mighty; but in righteousness shalt you judge your neighbor.” (Leviticus 19:15) Maimonides insists that judges must have stainless reputations; they must conduct themselves in such a way that not only is justice done, but so that it is seen to have been done. Appearances count: a judge or judicial process which smells fishy is a problem. President Obama said tonight that “we need to accept that this decision was the grand jury’s to make.” In other words, he said we have to accept the verdict of our legal system. In practical terms, yes, the grand jury is over and Officer Wilson will never stand trial in a criminal court. But today’s events say loud and clear to me that we must deal with the injustices in our system, precisely because so many people distrust not only this verdict, but the entire system that produced it. If you are unhappy with the demonstrations, if you are unhappy with today’s verdict, no matter what “side” you are on, surely we can all agree that we should have a system of justice that is truly just, to which every law-abiding person can appeal with confidence. People are out in the street because they believe they cannot trust the legal system or law enforcement. They are not crazy. Again, if you haven’t looked at the list of studies Mr. Quigley offers in his article, I beg that you do so. We need an end to traffic stops that target black drivers. When black drivers are stopped, they should get exactly the same treatment as a white driver in the same circumstances. If whites and blacks engage in drug offenses in roughly equal proportions, then arrests should also match those proportions. We need to improve the public defender system and insure that every person gets a fair trial, because any individual might be innocent. There should be no difference in the length of prison sentences for black and white offenders. I am sure there are other things that need to be done, and experts who have ideas how to get there. My point is that what we have right now is not a good system of justice, because too many people believe it to be unjust. We must work towards a perception of fairness and justice by all citizens, not just certain privileged groups of citizens. There is no quick or easy fix. “Justice, justice you shall pursue” cannot be reduced to “chase the bad guys.” Guns won’t fix it, Humvees won’t fix it, slogans won’t fix it, and riots definitely won’t fix it. What we need is a national renewal of dedication to the proposition that all men and women are created equal, that in our nation, justice is indeed for all. Today I was scheduled for jury duty. I kept the day clear, called last night to see if they wanted me at 9 a.m., and then phoned again at 11 a.m. to see if they wanted me at 1 p.m. They didn’t want me. I’m done for the next year. 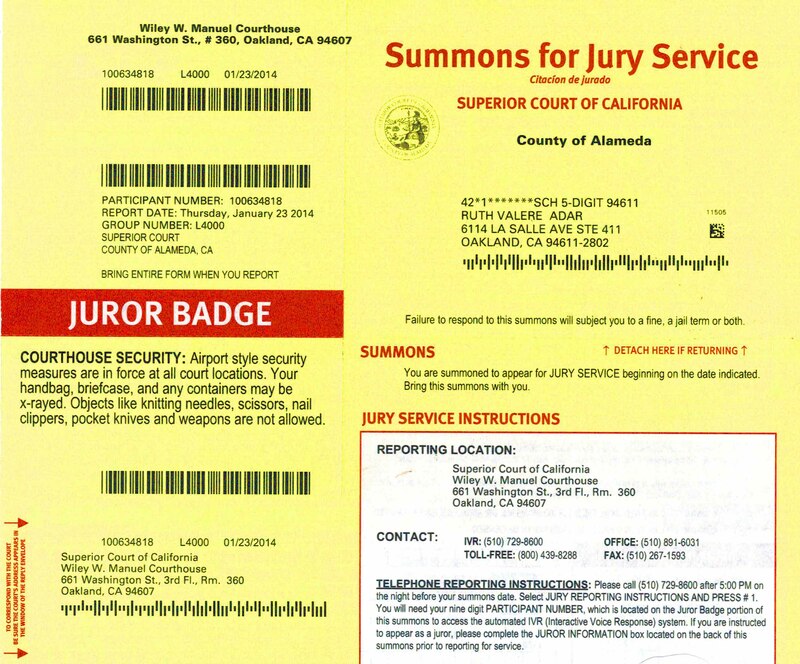 This year jury duty was no big deal. Some years I go in for one cattle call, and then they release me. A couple of years ago, I went in for my cattle call, and then back again and again as the jury was selected, until I was Juror #8. That year it was a two week job. That time, I got to see the whole process, including the process of people trying to get released from duty. The judge was tough but fair: single proprietors of small businesses and single caretakers of small children went home almost immediately, serving almost no time. People with long-planned nonrefundable vacations were released, too. A couple of folks who did not have the ability to follow the arguments were gently sent home. People who merely couldn’t be bothered were held to serve, at least one of them on the jury itself. He quit whining about it about the third day, as I recall. We worked hard. Even the whiny guy who didn’t want to be there worked hard, by the time we got to deliberations. During the days of testimony and waiting, we worked hard at following the rules: no chatting about it, no opinions, just take it all in. We understood that years of a man’s life depended on our behavior and decisions. We saw that witnesses had been unwilling, and we saw the damage to the victim. We heard conflicting testimony. We knew, too, that there were many things we were not allowed to see or hear, and we had to accept that. We knew that the crime in question was too common for the newspapers, but that it represented a small piece of a big problem in our community. We intuited other crimes that the defendant may have committed, but those were not the matter at hand. After the testifying was done, I served as foreperson of the jury as we processed information and slowly re-covered what we had seen and heard. I took vote after vote, stopping to discuss and process some more after each vote, getting us closer to a verdict. As I said, we all worked hard. At the end of it, we convicted a man of a felony. At the end of it, I felt that I’d done my very best, that we’d done our very best, and I hope justice was done. At the end of it, I had learned that nothing on television even approximates reality, especially reality shows. I would just as soon not serve on a jury again. The thing is, every defendant is some mother’s child, a human being who needs a fair trial whatever he or she deserves at the end of that trial. It is an imperfect system, but as the judge said to us at the end of it, it’s better than any other system human beings have devised. As a Jew, I’m proud of the many contributions of Jewish civilization to the processes of law. As a rabbi, I am conscious of the requirement of Jewish law and tradition that I obey the law and serve: dina d’malchuta dina, “the law of the land is the law.” I did jury duty today serving my responsibilities as an American and as a Jew.